Some journalists remember the day the future arrived: We felt like James Bond on special assignment when our editors, playing the part of provision master Q, handed us the portable device that would allow a story to be written in the field and transmitted back to the office. 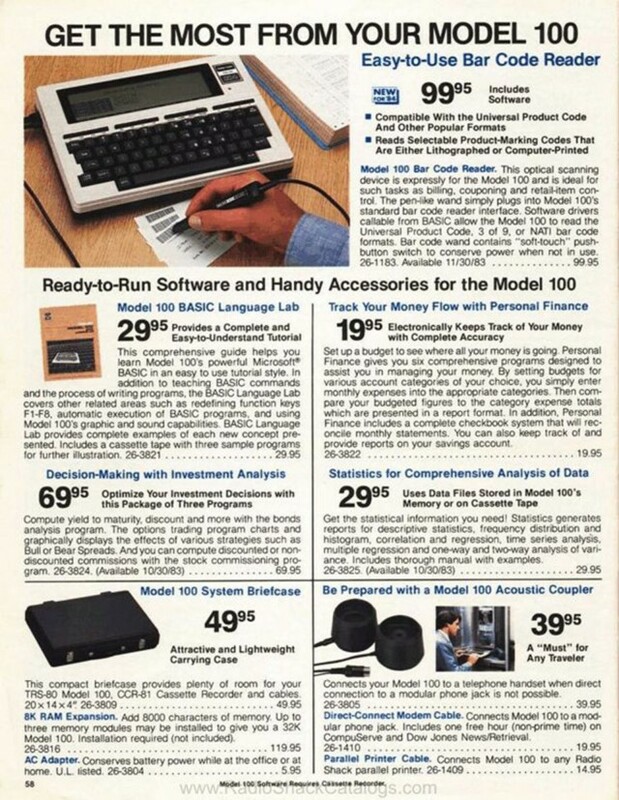 So when Radio Shack said earlier this month it would file for bankruptcy, more than a few of us flashed back to the TRS-80 Model 100, one of the first notebook-style computers. 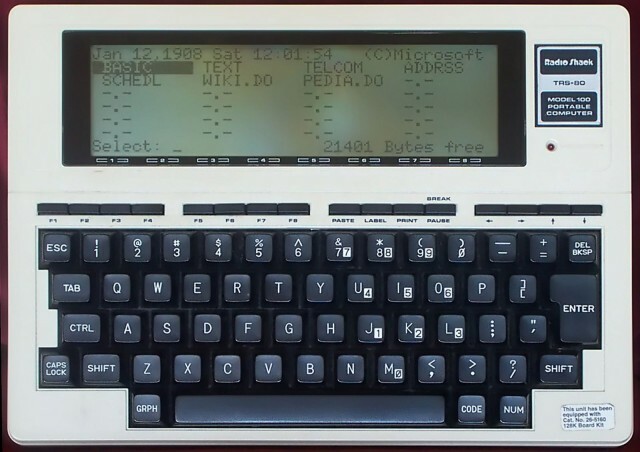 Released in 1983, it set portable computing in motion. The TRS-80’s liquid-crystal display showed eight lines of text. The computer came in 8K and 24K versions and weighed just over 3 pounds. A later version, the Model 200, boasted a flip-up screen that showed even more text, but the original model was by far Radio Shack’s most popular, with more than 6 million sold. It was originally made by Kyocera in Japan as the Kyotronic 85. The Tandy Corporation purchased the rights to the machine and sold it in its stores across North America. The TRS-80 was affectionally called the “Trash-80.” You could drop it, several times even, and shrug it off because you could always count on it working post-impact. I was a sports stringer for a newspaper back in 1985 when I was handed a blue bag containing a Model 100. I was assigned to be the second writer at an NFL game. I would help the main writer gather quotes for a game story plus I would write a sidebar of my own. The full-size keyboard had a nice feel for quick, percussive finger strokes and the screen made composing a breeze. With the story finished and deadline approaching, it was time to transmit via the Model 100’s built-in modem. That’s when you would say a little prayer to whatever saint oversaw early commercial computers. This was long before email, and the prayer was necessary because to send a story, you had to attach couplers to a phone, dial a number, listen for a chirp and hit send (or return, I can’t remember which button exactly). The couplers had to be on just so; sometimes, a story wouldn’t make it and you’d be forced to transmit again. Later models allowed you to plug the phone line into the side of your device. Over the nearly two dozen times I got to use the Model 100, I only remember one time pushing deadline because of problems with my couplers in the press box. A colleague let me use his couplers while he finished up his story. I made it and kept getting assignments. His preferred Radio Shack device was the Model 200, with the screen that displayed 24 lines of text. Reusse need not weep. His beloved early-career writing tool will likely outlast the stores they were sold in. There are at least 100 people in the United States with multiple working Radio Shack computers that make up Club100, a group devoted to keeping the power running through these early portable computers — and pushing the outdated technology to do modern-day computing tasks. Rick Hanson formed the club shortly after the release of the Model 100 and ran it as a successful business, servicing and repairing the machines. He passed away a few years back and the group now sees itself as a hobbyist vintage computer club. Hanson would sometimes show an unknowing visitor just how tough the machine was by throwing a Model 100 across the room at a wall and then turning on the power, said Ken Pettit, a Club100 member who built a “New Age Digital Storage Box,” which is an SD card reader that works with the Model 100. Club members are also trying to figure out how to make the Model 100 work with Wi-Fi and maintain its portability so it could be used in a coffee shop to scroll the internet. More than three decades after its release, the Trash-80 has become a cult classic. 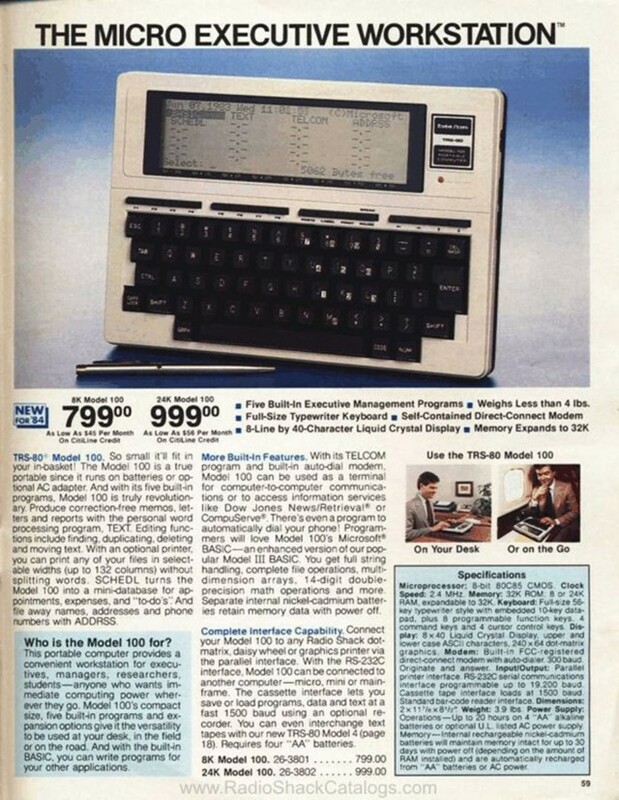 This entry was posted in Apple news and tagged Club100, notebook computers, Radio Shack TRS-80 Model 100, radio-shack, Throwback Thursday Tech, Trash-80. Bookmark the permalink. BusyContacts is the replacement contacts app you’ve been waiting for.